Dendropsophus is a monophyletic anuran genus with a diploid number of 30 chromosomes as an important synapomorphy. However, the internal phylogenetic relationships of this genus are poorly understood. Interestingly, an intriguing interspecific variation in the telocentric chromosome number has been useful in species identification. To address certain uncertainties related to one of the species groups of Dendropsophus, the D. microcephalus group, we carried out a cytogenetic analysis combined with phylogenetic inferences based on mitochondrial sequences, which aimed to aid in the analysis of chromosomal characters. Populations of Dendropsophus nanus, Dendropsophus walfordi, Dendropsophus sanborni, Dendropsophus jimi and Dendropsophus elianeae, ranging from the extreme south to the north of Brazil, were cytogenetically compared. A mitochondrial region of the ribosomal 12S gene from these populations, as well as from 30 other species of Dendropsophus, was used for the phylogenetic inferences. Phylogenetic relationships were inferred using maximum parsimony and Bayesian analyses. The species D. nanus and D. walfordi exhibited identical karyotypes (2n = 30; FN = 52), with four pairs of telocentric chromosomes and a NOR located on metacentric chromosome pair 13. In all of the phylogenetic hypotheses, the paraphyly of D. nanus and D. walfordi was inferred. D. sanborni from Botucatu-SP and Torres-RS showed the same karyotype as D. jimi, with 5 pairs of telocentric chromosomes (2n = 30; FN = 50) and a terminal NOR in the long arm of the telocentric chromosome pair 12. Despite their karyotypic similarity, these species were not found to compose a monophyletic group. Finally, the phylogenetic and cytogenetic analyses did not cluster the specimens of D. elianeae according to their geographical occurrence or recognized morphotypes. We suggest that a taxonomic revision of the taxa D. nanus and D. walfordi is quite necessary. We also observe that the number of telocentric chromosomes is useful to distinguish among valid species in some cases, although it is unchanged in species that are not necessarily closely related phylogenetically. Therefore, inferences based on this chromosomal character must be made with caution; a proper evolutionary analysis of the karyotypic variation in Dendropsophus depends on further characterization of the telocentric chromosomes found in this group. The genus Dendropsophus was resurrected by Faivovich et al. to include all of the species previously referred to as the 30-chromosome Hyla species. However, fewer than 30 of the 92 species of Dendropsophus currently known  have been karyotyped to date [3–11]. Because the karyotype of Xenohyla, which is thought to be the sister group of Dendropsophus, is still unknown, it is not possible to infer whether 2n = 30 is a synapomorphy of Dendropsophus or Dendropsophus + Xenohyla. The monophyly of Dendropsophus has been supported by molecular data in different studies [1, 12, 13]. Nevertheless, the monophyly of each of the nine species groups recognized in Dendropsophus by Faivovich et al. remains an interesting issue for further research. The D. microcephalus group is the most speciose group in the genus, including more than 30 species [1, 2]. Wiens et al. expanded the number of sampled species of the D. microcephalus group and reported the paraphyly of this group with respect to Dendropsophus riveroi, which had been allocated to the D. minimus group by Duellman  and tentatively kept there by Faivovich et al. . Fouquet et al. recovered within the D. microcephalus group not only D. riveroi but also D. gaucheri, a species previously allocated to the D. parviceps group. Despite that the interspecific relationships in the D. microcephalus group remain to be elucidated, some of its species were putatively attributed to two clades by Faivovich et al. : the Dendropsophus decipiens clade (including D. berthalutzae, D. decipiens, D. haddadi and D. oliveirai) and the Dendropsophus rubicundulus clade (including D. anataliasiasi, D. araguaya, D. cachimbo, D. cerradensis, D. elianeae, D. jimi, D. rhea, D. rubicundulus and D. tritaeniatus). These clades correspond to species groups previously proposed by other researchers [16–18], but Faivovich et al. emphasized the absence of a rigorous test for the monophyly of each of these groups. In addition to the lack of phylogenetic information about the species of the D. microcephalus group, several taxonomic questions have persisted. The very small size and highly similar external morphologies of these frogs make their taxonomic identification challenging, resulting in a number of taxonomic problems, including specimen misidentification. For example, the species D. nanus, D. sanborni, D. walfordi and D. jimi have been the target of taxonomic discussion [10, 15, 19]. Dendropsophus sanborni was already considered to be a subspecies of D. nanus[20, 21] but was later considered a valid species by Basso et al.. Furthermore, based on morphological data, Lutz  and Duellman  considered D. walfordi to be synonymous with D. nanus, but Langone and Basso  resurrected D. walfordi as a valid species based on vocalization data and tadpole morphology. Recently, Fouquet et al., in a phylogenetic analysis that included two specimens of D. nanus and one of D walfordi, again raised questions regarding these taxa. However, the authors could not draw any conclusions because of the low number of populations sampled and strongly recommended further studies to evaluate the status of D. nanus and D. walfordi. Interestingly, the karyotypes found for D. nanus and D. sanborni specimens by Medeiros et al. were the same as those described previously for D. sanborni and D. nanus, respectively. Medeiros et al. argued that the morphological similarity of these two species had resulted in their misidentification, which was corroborated by Gruber et al., who detected the same karyotypes described by Medeiros et al. for D. nanus and D. sanborni. The karyotypes of D. walfordi and D. jimi remain unknown. Dendropsophus elianeae is another member of the D. microcephalus group with intriguing characteristics that warrant further study. This species was recently described by Napoli and Caramaschi  after a revision of specimens previously identified as D. rubicundulus. Three additional geographical morphotypes were recognized by Napoli and Caramaschi : one for specimens from the southern regions of the Brazilian states of São Paulo and Minas Gerais, a second for specimens from the northern localities of the Brazilian state of São Paulo and a third morphotype for the specimens from central Brazil. Cytogenetic analyses had previously been performed only with specimens of D. elianeae from a locality in the southern region of São Paulo state, and some karyotypic differences between this species and D. rubicundulus were described . Cytogenetic and molecular analyses including all three morphotypes described by Napoli and Caramaschi  are not yet available. Considering the interesting variations in the number and size of telocentric chromosomes and the variation in NOR location among the karyotypes of the Dendropsophus species [examples in [4, 6, 10, 11]; review in , we contributed to the study of the D. microcephalus group by (i) describing the karyotypes of D. walfordi and D. jimi and (ii) providing karyotypic data for several of the populations of D. nanus, D. sanborni and D. elianeae that were not included in the studies by Skuk and Langone , Medeiros el al. or Gruber et al.. Additionally, 12S rDNA sequences from all of these species were included in a phylogenetic analysis aiming to better understand the relationships among the species that were analyzed cytogenetically. Because of the taxonomic questions regarding the D. microcephalus group, we used the same specimens to obtain DNA sequences and cytogenetic data whenever possible. Through this approach, we also intended to show how analyzing chromosomal characters based on the phylogenetic relationships inferred from another set of data could be helpful in investigating which chromosomal characters constitute synapomorphies, symplesiomorphies and homoplasies. This type of combined analysis could be particularly important when the chromosomal data available are not sufficient for a proper phylogenetic analysis. In all of the inferred topologies (Figure 1 and Additional files 1 and 2: Figures S1 and S2), the species currently assigned to the D. microcephalus group included in this study clustered within a clade that also included the species D. riveroi. 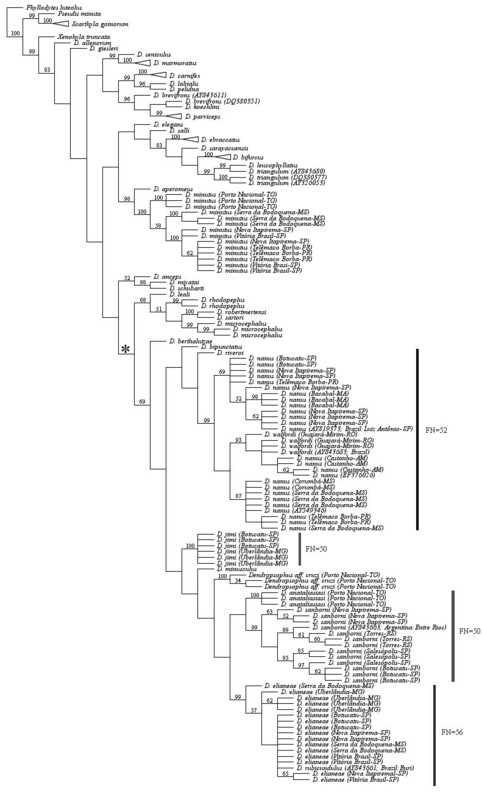 The phylogenetic relationships inferred for D. jimi, a species belonging to the D. microcephalus group that was not included in the previous phylogenetic analyses of Faivovich et al., Wiens et al. and Pyron and Wiens , differed among the analyses. In the topology inferred through POY analysis, D. jimi was the sister group of a clade comprising D. rubicundulus (see discussion about the D. rubicundulus sequence used below), D. elianeae, D. sanborni, D. anataliasiasi, Dendropsophus aff. cruzi and D. minusculus (Figure 1). However, in the TNT analysis, D. jimi and D. bipunctatus formed a sister group to the D. minusculus + D. berthalutzae group (Additional file 1: Figure S1). In the Bayesian analysis, D. jimi was included in a polytomy with D. berthalutzae, D. bipunctatus and D. minusculus (Additional file 2: Figure S2). Strict consensus cladogram scored at 2070 inferred from POY analyses of 12S rDNA sequences. Numbers adjacent to nodes indicate bootstrap values. The karyotype fundamental number (FN) is indicated for some species. The asterisk indicates the node of the clade that includes the species of the D. microcephalus group. Sample locations are provided for all the specimens we collected for this study and also for the specimens of D. nanus, D. sanborni, D. rubicundulus and D. walfordi whose 12S rDNA sequences were already available at the GenBank (their GenBank accession numbers are indicated). The GenBank accession numbers are also indicated for D. brevifrons and D. triangulum because these species were not recovered as monophyletic groups. Dendropsophus anataliasiasi, another species not included in the previous studies of phylogenetic relationships, was grouped with D. sanborni in the TNT and POY cladograms, but the clade did not receive significant support (Figure 1 and Additional file 1: Figure S1). In the Bayesian analysis, D. anataliasiasi was included in a polytomy with D. sanborni and D. elianeae (Additional file 2: Figure S2). Interestingly, the sequence assigned to D. rubicundulus by Faivovich et al. [GenBank: AY843661] clustered among the D. elianeae sequences in all of the analyses (Figure 1 and Additional files 1 and 2: Figures S1 and S2). In addition, the specimens of D. elianeae were not grouped according to their geographic distribution, despite the fact that several specimens representing the geographic range of this species (central Brazil, Minas Gerais state and different regions of São Paulo state) were analyzed. Another relevant finding was the paraphyly of D. nanus and D. walfordi, which was inferred in all the analyses (Figure 1 and Additional files 1 and 2: Figures S1 and S2). Interestingly, the karyotype described for D. walfordi was completely indistinguishable from that described for D. nanus, as reported below. 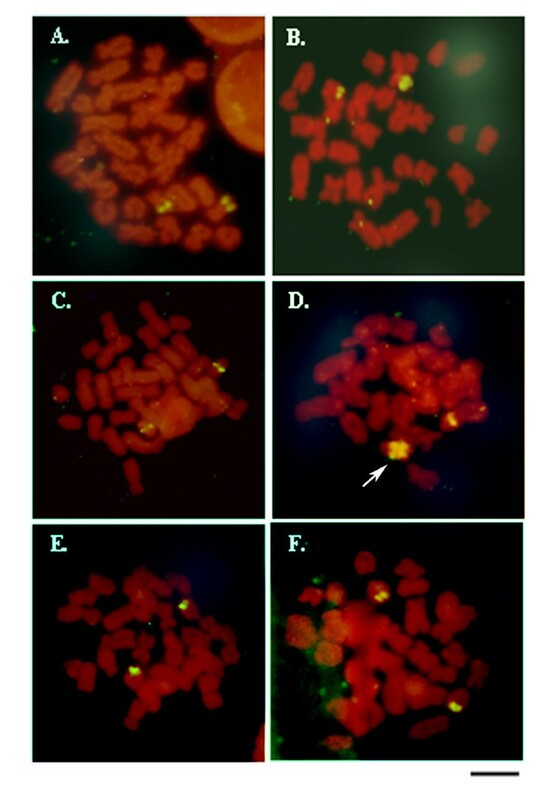 Dendropsophus elianeae, D. jimi, D. nanus, D. sanborni and D. walfordi exhibited karyotypes with 2n = 30 chromosomes (Figures 2, 3, 4 and 5) but differed in the number of telocentric chromosomes. As a proper inference of the homeology of the chromosomes belonging to the different species is not yet possible, we ordered them within each karyotype according to their sizes. Karyological data of Dendropsophus nanus and Dendropsophus walfordi.Karyotype arranged from Giemsa-stained (A, C) and C-banded metaphases (B, D) of D. nanus (A, B) and D. walfordi (C, D). The insets in A and C show the heteromorphic pair 6 of the ZUEC 13179 specimen and the Ag-stained NOR-bearing chromosomes 13. In B, note a C-band adjacent to the centromere of chromosome 3 observed in individuals from Telêmaco Borba-PR. The arrows in A and C indicate the secondary constrictions of the NORs. Bar = 5 μm. Karyological data of Dendropsophus sanborni and Dendropsophus jimi.Karyotype arranged from Giemsa-stained (A, C) and C-banded metaphases (B, D) of D. sanborni (A, B) and D. jimi (C, D). The insets in A and C show the Ag-stained NOR-bearing chromosomes. The inset in A shows the NOR-bearing chromosome pairs 12 and 12´, found in Botucatu-SP, and the pair 12´´, found in Torres- RS. The arrow indicates the secondary constriction in the NOR-bearing chromosome pair 12 of D. sanborni. Bar = 5 μm. Chromosome mapping of nucleolar rDNA in Dendropsophus nanus , Dendropsophus walfordi , Dendropsophus sanborni and Dendropsophus jimi . Metaphases of D. nanus (A), D. walfordi (B), D. sanborni from Botucatu-SP (C, D) and Torres-RS (E), and D. jimi (F) after FISH with rDNA probes. In C-E, note the three different NOR phenotypes found for D. sanborni, which are identified by the presence of the NOR-bearing chromosome pairs 12 (C), 12´ (D) and 12´´ (E) (see text for details). The arrow in D indicates the duplicated NOR in one of the homologs of the NOR-bearing chromosome pair 12´. Bar = 5 μm. Karyological data of Dendropsophus elianeae.Karyotype arranged from Giemsa-stained (A) and C-banded metaphases (B) of Dendropsophus elianeae. The inset in A shows the Ag-stained NOR-bearing chromosome pair 13. In C, NOR-bearing chromosomes of D. elianeae after Giemsa staining (left) and sequential Ag-staining (right) are shown. Bar = 5 μm. The specimens of D. nanus and D. walfordi showed very similar karyotypes, with a fundamental number (NF) of 52, 6 pairs of metacentric chromosomes (pairs 3, 8, 9, 10, 11 and 13), 5 pairs of submetacentric chromosomes (pairs 1, 2, 4, 5 and 7) and 4 pairs of telocentric chromosomes (pairs 6, 12, 14 and 15) (Figure 2). One specimen of D. nanus from Serra da Bodoquena (ZUEC 13179) presented a karyotype with a heteromorphic pair 6, which was composed of a telocentric morph 6a and a submetacentric morph 6b; its NF was, therefore, 53 (Figures 2A, 2B and Additional file 3: Figure S3). In some D. nanus and D. walfordi metaphases, a secondary constriction was detected distally on the long arm of pair 13 (Figures 2A and 2C) in the same site detected as a NOR by Ag-NOR staining (Figures 2A and 2C - insets) and by FISH with an rDNA probe (Figures 4A and 4B). The C-banding analysis detected the centromeric regions of all of the chromosomes of D. nanus and D. walfordi (Figures 2B and 2D). In the C-banded metaphases of specimens of D. nanus from Telêmaco Borba, a small pericentromeric C-band was detected in the metacentric chromosome 3 (Figure 2B). The karyotype of D. sanborni was very similar to that of D. jimi, with NF = 50, 6 pairs of metacentric chromosomes (pairs 3, 8, 9, 10, 11 and 14), 4 pairs of submetacentric chromosomes (pairs 1, 2, 4 and 7) and 5 pairs of telocentric chromosomes (pairs 5, 6, 12, 13 and 15) (Figure 3). In D. sanborni, interindividual variation was observed in relation to NOR sites. Although specimens from Torres-RS provided a NOR that was detected terminally in the long arm of chromosome 12 (pair 12´´ in Figures 3A and 4E), specimens from Botucatu-SP presented a NOR that was detected interstitially in the long arm of chromosome 12 (pair 12 in Figures 3A and 4C). Interestingly, one specimen from Botucatu-SP exhibited a heteromorphic chromosome pair 12 (designated pair 12´) that was composed of a chromosome with an interstitial NOR and a chromosome with an interstitial and a terminal NOR (Figures 3A- inset and 4D). In D. jimi, both Ag-NOR staining and FISH with the rDNA probe detected a NOR in the terminal region of the long arm of chromosome 12 (Figures 3C and 4F). C-banding analysis detected the centromeric regions of all of the chromosomes in the D. jimi and D. sanborni karyotypes (Figures 3B and 3D). All of the specimens of D. elianeae had a karyotype with FN = 56 composed of 8 pairs of metacentric chromosomes (pair 3, 8–12, 14–15), 4 pairs of submetacentric chromosomes (pairs 1, 2, 4 and 7), 1 pair of subtelocentric chromosomes (pair 13) and 2 pairs of telocentric chromosomes (pairs 5 and 6) (Figure 5). The NOR was detected in the short arm of the subtelocentric chromosome 13 by Ag-NOR staining (Figures 5A – inset and 5C). This NOR could be seen as a secondary constriction in only 14 chromosomes of 10 Giemsa-stained metaphases (Figures 5A and 5C) and these samples were used for the inference of the arm ratio of chromosome 13. All eight measured Giemsa-stained metaphases were subjected to analysis using the Ag-NOR method to confirm the NOR location. Because the average value for the arm ratio was 3.32, the NOR-bearing chromosome 13 was classified as subtelocentric, following the convention of Green and Sessions . In the majority of the Giemsa-stained metaphases in which the NOR constriction could not be observed, the limit of the short arm of chromosome 13 could not be identified; as such, it could have been misinterpreted as telocentric. In these cases, sequential staining using Giemsa and the Ag-NOR method was especially useful for the correct recognition of the NOR-bearing chromosome pair. The C-banding analysis detected all of the centromeric regions in the karyotype of this species (Figure 5B). Our phylogenetic analyses increased the number of sampled species of the D. microcephalus group from 11 [the number of species analyzed by Wiens et al., not including D. rubicundulus because of the taxonomic questions regarding sequence AY843661 mentioned below] to 15 due to the inclusion of D. anataliasiasi, D. cruzi, D. elianeae and D. jimi. All of the sampled species from this group clustered in a clade that also included D. riveroi, a species that was previously assigned tentatively to the D. minimus group [1, 14] but has a known phylogenetic relationship with the species of the D. microcephalus group, as indicated by Wiens et al. and Fouquet et al.. Despite the congruence of these data, inference based on a larger number of Dendropsophus species is still necessary to conclusively assess the monophyly of the D. microcephalus group. The inclusion of a number of species currently assigned to the D. microcephalus group, which comprises more than 30 species, is particularly important not only for testing the monophyly of this group but also for proper inferring the internal relationships. With regard to the D. rubicundulus clade, as tentatively defined by Faivovich et al. , our sample also left questions. In our analyses, the sampled species of this group did not compose a clade. In the POY analysis, the less-inclusive clade that clustered the three sampled species of the D. rubicundulus group (D. anataliasiasi, D. elianeae and D. jimi) also included D. sanborni, D. minusculus and Dendropsophus aff. cruzi. In the TNT and Bayesian inferences, the D. rubicundulus group was additionally paraphyletic with respect to D. bipunctatus and D. bertalutzae, the latter being the only species of the D. decipiens group  sampled here. Therefore, the monophylies of the D. rubicundulus group and the D. decipiens group remain to be tested. Because the internal relationships of the D. microcephalus group are still unclear, it is not yet possible to present an accurate evolutionary interpretation of all of the cytogenetic data available for the Dendropsophus species, including the variation of the karyotypic fundamental number. However, some clades were stable and highly supported in all of our inferences and allowed an interesting combined phylogenetic and cytogenetic analysis that provided relevant contributions on the species level. One of these concerns the species D. nanus and D. sanborni, which were subject of taxonomic controversy until recently. The 12S rDNA sequences we obtained for D. nanus were very similar to those assigned to this species by Faivovich et al. [GenBank: AY549346] and Wiens et al. [GenBank: AY819373]; these sequences were clustered together in our phylogenetic analyses within a clade that did not include D. sanborni. The same populations of D. nanus and D. sanborni sampled for our phylogenetic analyses were also karyotyped here, as well as by Medeiros et al., and showed 2n = 30 karyotypes with FN = 52 or 50, respectively. Our combined analyses corroborate the hypothesis proposed by Medeiros et al. and supported by Gruber et al. regarding the identification of the species analyzed. However, they disagree with the identification presented by Skuk and Langone . This finding highlights how important it is to generate and analyze a different set of data obtained from the same populations or specimens. Therefore, combining other sets of data, in addition to their cytogenetic characters, seems to be an interesting approach that should be considered by cytogeneticists, particularly when studying not only species with known taxonomic questions but also polymorphic species. All of the specimens of D. nanus that were analyzed cytogenetically here (from Telêmaco Borba-PR, Bacabal-MA and Serra da Bodoquena-MS) showed the same karyotype previously described by Medeiros et al. (for specimens of D. nanus from Nova Itapirema-SP) and Gruber et al. (for specimens of D. nanus from Rio Claro-SP), with the exception of one specimen from Serra da Bodoquena, which had FN = 53 instead of FN = 52. The heteromorphism observed for pair 6 in this specimen of D. nanus, in which chromosome 6a was morphologically similar to the telocentric pair 6 of the other specimens whereas chromosome 6b was submetacentric, might be explained by pericentric inversion. The hypothesis of inversion is based on the chromosomal morphology and consistent total length of the submetacentric chromosome, which would have been altered in the case of a chromosomal deletion or translocation. Another feature found in only a few specimens of D. nanus is a heterochromatin block observed close to the centromere in the long arm of chromosome 3 that occurs in some specimens from Telêmaco Borba. The typical karyotype of D. nanus, with FN = 52, differs greatly from that of D. sanborni, which has five pairs of telocentric chromosomes (FN = 50). The karyotype of the specimens of D. sanborni from Torres-RS described here is identical to that previously presented for specimens from Nova Itapirema-SP , even with regard to the terminal location of the NOR in the telocentric chromosome 12. Karyotyping of specimens of D. sanborni from Botucatu-SP revealed an intrapopulational variation because three morphs of the NOR-bearing chromosome 12 were found. One of these morphs exhibiting an interstitial NOR was the same type found in the specimens of D. sanborni from Rio Claro-SP analyzed by Gruber et al..
Interestingly, the karyotype of D. jimi, which was described here for the first time, is identical to that of specimens of D. sanborni from Nova Itapirema-SP , Torres-RS and Botucatu-SP (only those with a terminal NOR in chromosome pair 12). Based on the phylogenetic relationships of D. jimi and D. sanborni inferred here, the karyological similarities between these taxa cannot be interpreted as synapomorphies of these species. This finding is a clear example of the importance of interpreting chromosomal data in light of their phylogenetic inferences. If this caution had not been taken and only the similarities between the karyotypes of these anurans had been reported, it could lead to misinterpretation by non-specialist readers, and the cytogenetic similarities could be inadequately read as synapomorphies for the species in study. Another relevant contribution of our analyses concerns the paraphyly of D. nanus with respect to D. walfordi. The nesting of D. walfordi (from Brazil) among three specimens of D. nanus (two from French Guiana and one from Argentina) was already recovered by Fouquet et al. [15, 29]. In our study, which included specimens from seven Brazilian localities, the paraphyly of D. nanus and D. walfordi was also inferred. Interestingly, the karyotype of D. walfordi was indistinguishable from that of D. nanus using the classical cytogenetic techniques employed here. Therefore, our data corroborate the proposal of synonymy of D. walfordi and D. nanus presented by Lutz  and Duellman . However, further studies that include other DNA sequences, such as 16S rDNA and COI sequences, and other source of data are still necessary to conduct a proper taxonomic review of this issue. Finally, our phylogenetic analyses did not cluster the specimens of D. elianeae according to their geographical range and no cytogenetic variation was detected among the specimens of D. elianeae from Botucatu-SP, Nova Itapirema-SP and Serra da Bodoquena-MS, which are localities that correspond to those of the geographic morphotypes SSP (southern São Paulo), NSP (northern São Paulo) and CBR (central Brazil), respectively, recognized by Napoli and Caramaschi . In addition, it is worth noting that the 12S rDNA sequence of a specimen previously assigned to D. rubicundulus [GenBank: AY843661]  was clustered among the sequences of D. elianeae in all of our phylogenetic analyses. This finding raises doubts regarding the taxonomic identification of that D. rubicundulus specimen. Unfortunately, other specimens of D. rubicundulus could not be included in our analyses, so further studies are necessary to clarify this issue. The karyotype reported here for the D. elianeae specimens is most likely the same as that previously described by Gruber et al. for specimens of D. elianeae from the Rio Claro municipality in southern São Paulo state, despite the distinct numeric classification of some chromosome pairs. Because several of the chromosomes in this karyotype are sufficiently similar in terms of size and centromeric position and could not be differentiated by any specific marker (differential C-band, for example), the attribution of a numeric classification to the chromosomes of this karyotype is a difficult task that results in only a tentative arrangement of the chromosome pairs. Therefore, the differences in the numeric classification of the chromosomes between the D. elianeae karyotype described by Gruber et al. and that presented here most likely do not constitute real cytogenetic differences. Another apparent difference between the D. elianeae karyotype described by Gruber et al. and the karyotype presented here involves the morphological classification of the NOR-bearing chromosome. Gruber et al. classified this chromosome as telocentric but also reported the presence of a NOR in its short arm. Because we measured all of the NOR-bearing chromosomes in which the secondary constriction of the NOR could be easily identified, we consider this chromosome to be subtelocentric, but it is most likely the same chromosome that carries the NOR in the karyotype described by Gruber et al.. In addition, by mapping the karyotype fundamental numbers on the phylogenies (Figures 1, 2), we may consider the karyotype of D. elianeae to be derived from an ancestral karyotype with FN = 50 similar to those found in D. jimi and D. sanborni. Otherwise, neither the homeology between the telocentric chromosomes of the above-mentioned species nor the possible rearrangement that might have resulted in the presumed FN increase can be elucidated. Therefore, neither the cytogenetic data nor the phylogenetic analyses presented here were able to corroborate the geographic variation reported by Napoli and Caramaschi  for the species D. elianeae. Further studies including DNA markers that are more informative for this scale of analysis, such as 16S rDNA, COI gene and microsatellite sequence markers, could be very useful in this case. In conclusion, we observed that while in some cases the obtained cytogenetic data do not help to distinguish between valid species of Dendropsophus (such as D. jimi and D. sanborni), in others, the number of telocentric chromosomes clearly differs interspecifically, which can be useful in taxonomic analyses (such as for D. nanus and D. sanborni). Despite the interesting variation in the karyotypic fundamental number found in Dendropsophus, it is not yet possible to make a clear inference of homeology between the telocentric chromosomes of different species because several chromosomes of each karyotype have been found to be very similar based on analyses using the most commonly employed cytogenetic techniques. Therefore, the current numerical classifications of the chromosomes in the Dendropsophus karyotypes do not reflect interspecific chromosomal homeologies and, in most cases, the inference of homeology between the telocentric chromosomes of different species is merely speculative. Thus, to allow for the formulation of a proposal regarding the chromosomal rearrangements involved in the karyotypic differentiation of the Dendropsophus species, further descriptions of new chromosomal markers and elucidation of the phylogeny of this genus are still necessary. The above considerations regarding the homeology of chromosomal characters were only possible because the cytogenetic data were analyzed in the light of phylogenetic inferences. Therefore, this could be an interesting approach to analyze the evolution of chromosomal data, even when the available karyotypes are not sufficient for generating proper phylogenetic inferences by themselves. Specimens of D. elianeae, D. jimi, D. nanus, D. sanborni and D. walfordi from localities ranging from the extreme south to the north of Brazil were used in cytogenetic and phylogenetic analyses. The sampled D. elianeae individuals included specimens from central Brazil (Serra da Bodoquena-MS), Minas Gerais state (Uberlândia municipality), and southern (Botucatu municipality) and northern (Nova Itapirema and Vitória Brasil municipalities) areas of São Paulo state (Table 1). The phylogenetic analyses also included 12S rDNA sequences from specimens of D. anataliasiasi and D. minutus. The animals were collected and submitted to euthanasia under permit issued by the Instituto Brasileiro do Meio Ambiente e dos Recursos Naturais Renováveis (IBAMA, processes 10461 and 02001.008876/01-83). The voucher number and collection site of each of the specimens analyzed are indicated in Table 1. DZSJRP: Coleção Científica Amphibia Adults, Department of Zoologia e Botânica, Universidade Estadual Paulista (UNESP), São José do Rio Preto, São Paulo, Brazil; SMRP: Collection of tissue and chromosome preparation “Shirlei Maria Recco Pimentel”, deposited at the Department of Structural and Functional Biology at the Biology Institute of the University of Campinas, Campinas, São Paulo, Brazil; ZUEC: Museu de Zoologia “Prof. Adão José Cardoso” (ZUEC), Universidade Estadual de Campinas (UNICAMP), Campinas, São Paulo, Brazil. aThis is a 373 bp sequence and the segment from nucleotide 2 to nucleotide 361 is exactly the same as the sequence JF973312 described by Fouquet et al. (2011). Because of the identity of these sequences and their short size, we included the sequence EF376026 but not the sequence JF973312 in our analyses. bTaxonomic questions exist regarding this sequence. See the text for details. cThe type locality of D. walfordi, designated Forte Príncipe da Beira (see Frost, 2011, for references), is located in Guajará-Mirim, RO. Identification of all the specimens employed in the cytogenetic and phylogenetic analyses, their procedence and voucher number. The GenBank accession number of each DNA sequence and the specimens which were karyotyped are indicated. DZSJRP: Coleção Científica Amphibia Adults, Department of Zoologia e Botânica, Universidade Estadual Paulista (UNESP), São José do Rio Preto, São Paulo, Brazil; SMRP: Collection of tissue and chromosome preparation “Shirlei Maria Recco Pimentel”, deposited at the Department of Structural and Functional Biology at the Biology Institute of the University of Campinas, Campinas, São Paulo, Brazil; ZUEC: Museu de Zoologia “Prof. Adão José Cardoso” (ZUEC), Universidade Estadual de Campinas (UNICAMP), Campinas, São Paulo, Brazil. In the phylogenetic analyses, we included 12S rDNA sequences (available in GenBank) from 30 species of Dendropsophus, as well as sequences from Xenohyla truncata, Pseudis minuta, Scarthyla goinorum and Phyllodytes luteolus, the last of which was used as the root (Table 1). We avoided the inclusion of short partial sequences (those with less than 50% of the length of the fragment of interest). The only exception was for a sequence of D. nanus from French Guiana (EF376026), a locality from which we could not sample. The chromosome preparations were obtained from intestinal and testicular cell suspensions, as described by King and Rofe  or Schmid . Prior to intestine and testes removal, the animals were deeply anesthetized. Chromosome preparations were stained with 10% Giemsa, processed for C-banding  and subjected to Ag-NOR staining  and fluorescent in situ hybridization (FISH)  with the rDNA probe HM123  (except for D. elianeae). All chromosome preparations were analyzed under an Olympus BX60 microscope. The chromosomes were classified as proposed by Green and Sessions . Genomic DNA was extracted from liver or muscle tissue stored at −70°C in the tissue bank of the Department of Structural and Functional Biology-UNICAMP, Campinas, SP, Brazil, using the TNES method. Tissue samples were immersed in TNES buffer solution (50 mM Tris pH 7.5, 400 mM NaCl, 20 mM EDTA, 0.5% SDS). The solution was subsequently supplemented with proteinase K (to a final concentration of 100 μg/mL), and the samples were incubated for 5 hours at 55°C. Then, 1/3 volume of NaCl 5M was added, and the samples were centrifuged. DNA was precipitated from the supernatant with isopropyl alcohol, washed with ethanol (70%), resuspended in TE (10 mM Tris–HCl, 1 mM EDTA pH 8.0) and stored at −20°C. The mitochondrial 12S ribosomal gene was partially amplified using the primers MVZ 59(L) and MVZ 50(H) . The PCR-amplified products were purified with the GFX PCR and Gel Band DNA Purification Kits (GE Healthcare, England) and directly used as templates for sequencing in an automatic ABI/Prism DNA sequencer (Applied Biosystems, Foster City, CA, USA) using the BigDye Terminator Kit (Applied Biosystems, Foster City, CA, USA), as recommended by the manufacturer. DNA sequences were bi-directionally sequenced and edited using Bioedit version 7.0.1 (http://www.mbio.ncsu.edu/BioEdit/bioedit.html). Fragments of approximately 810 bps of the 12S ribosomal genes from 80 specimens of Dendropsophus were sequenced as described above, and a data matrix consisting of 133 OTUs, including five sequences from outgroup species and a total of 37 species of Dendropsophus, was constructed. The GenBank accession numbers for all of the sequences used are presented in Table 1. Because parsimony  and likelihood [12, 13] criteria have been employed for the phylogenetic studies of Dendropsophus, we conducted both types of analyses. When using parsimony criterion, phylogenetic relationships were inferred (i) from analyses under dynamic homology, as implemented in the software POY v.4.1.2.1 , or (ii) from aligned sequences using the software TNT v.1.1 . A Bayesian analysis was implemented in the software MrBayes v.3.1.2  using the model GTR + I + G, inferred with the software MrModeltest v.2.3 . For the analyses using TNT and MrBayes, the sequences were first aligned with Clustal W , and a matrix was generated with 852 characters. The phylogenetic searches performed with POY included tree building (of Wagner trees), tree bisection–reconnection (TBR) swapping, perturbation using a parsimony ratchet and tree fusing. The analyses were run with a maximum execution time of 48 h and an opening indel cost of 3, indel extension cost of 1 and nucleotide substitution cost of 1 using the command “transform (tcm:(1, 1), gap_opening:2)”. To obtain an implied alignment from the POY analysis, the characters were transformed into static characters, and the generated matrix was exported using the command “phastwinclad.” The exported matrix was loaded with TNT v.1.1 to calculate the bootstrap support based on 1,000 pseudoreplicates. For the phylogenetic analysis using TNT software, the most parsimonious trees were inferred through heuristic searches performed using the command xmult, which combined sectorial searches, the ratchet, tree drifting and tree fusing. Gaps were considered to be missing data. The bootstrap values of the branches inferred in this analysis were calculated with 1000 pseudoreplicates. For the Bayesian inferences, two simultaneous analyses were run, each with four chains (three heated and one cold). In each analysis, 2,980,000 generations were run and one tree was sampled every 100 generations. A consensus topology and the posterior probability for each node were produced after discarding the first 25% of the trees generated. The ASDSF (Average Standard Deviation of Split Frequencies) value was below 0.01, and the PSRF (Potential Scale Reduction Factor) values were approximately 1.000. Lilian Ricco Medeiros, Luciana Bolsoni Lourenço contributed equally to this work. The authors thank M. Uetanabaro, R. Machado, S. C. Almeida, G. Vinciprova and M. Menin for their help in collecting specimens; Julián Faivovich for reading the manuscript and providing useful comments; Alessandra F. Costa and Klélia A. Carvalho for technical assistance in slide preparation and some FISH experiments, respectively; and V. G. D. Orrico and B. F. Teixeira for helpful insights on the taxonomic identification of some specimens. This work was supported by the Brazilian agencies Conselho Nacional de Desenvolvimento Científico e Tecnológico (CNPq), Fundação de Amparo à Pesquisa do Estado de São Paulo (FAPESP, proc. 00/11031-4 and Proc. 03/04243-3) and Fundação de Amparo à Pesquisa do Estado de Minas Gerais (FAPEMIG). LRM acquired the cytogenetic data and helped draft the manuscript. GTBTE acquired most of the DNA sequences. LBL acquired some of the cytogenetic data and DNA sequences, conducted the phylogenetic analyses and helped draft the manuscript. DCRF, APL, GVA and AAG helped collect and identified the specimens, provided support on zoological information and revised the manuscript. SMRP designed and coordinated the study and revised the manuscript. All authors read and approved the final manuscript.